Not to be confused with Reliance Anil Dhirubhai Ambani Group. The company is ranked 148th on the Fortune Global 500 list of the world's biggest corporations as of 2018. It is ranked 8th among the Top 250 Global Energy Companies by Platts as of 2016. Reliance continues to be India’s largest exporter, accounting for 8% of India's total merchandise exports with a value of Rs 147,755 crore and access to markets in 108 countries. Reliance is responsible for almost 5% of the government of India's total revenues from customs and excise duty. It is also the highest income tax payer in the private sector in India. The company was co-founded by Dhirubhai Ambani and Champaklal Damani in 1960's as Reliance Commercial Corporation. In 1965, the partnership ended and Dhirubhai continued the polyester business of the firm. In 1966, Reliance Textiles Engineers Pvt. Ltd. was incorporated in Maharashtra. It established a synthetic fabrics mill in the same year at Naroda in Gujarat. On 08 May 1973, it became Reliance Industries Limited. In 1975, the company expanded its business into textiles, with "Vimal" becoming its major brand in later years. The company held its Initial public offering (IPO) in 1977. The issue was over-subscribed by seven times. In 1979, a textiles company Sidhpur Mills was amalgamated with the company. In 1980, the company expanded its polyester yarn business by setting up a Polyester Filament Yarn Plant in Patalganga, Raigad, Maharashtra with financial and technical collaboration with E. I. du Pont de Nemours & Co., U.S. The Hazira petrochemical plant was commissioned in 1991–92. In 1993, Reliance turned to the overseas capital markets for funds through a global depositary issue of Reliance Petroleum. In 1996, it became the first private sector company in India to be rated by international credit rating agencies. S&P rated Reliance "BB+, stable outlook, constrained by the sovereign ceiling". Moody's rated "Baa3, Investment grade, constrained by the sovereign ceiling". In 1995/96, the company entered the telecom industry through a joint venture with NYNEX, USA and promoted Reliance Telecom Private Limited in India. In 1998/99, RIL introduced packaged LPG in 15 kg cylinders under the brand name Reliance Gas. The years 1998–2000 saw the construction of the integrated petrochemical complex at Jamnagar in Gujarat, the largest refinery in the world. In 2001, Reliance Industries Ltd. and Reliance Petroleum Ltd. became India's two largest companies in terms of all major financial parameters. In 2001–02, Reliance Petroleum was merged with Reliance Industries. In 2002, Reliance announced India's biggest gas discovery (at the Krishna Godavari basin) in nearly three decades and one of the largest gas discoveries in the world during 2002. The in-place volume of natural gas was in excess of 7 trillion cubic feet, equivalent to about 1.2 billion barrels of crude oil. This was the first ever discovery by an Indian private sector company. In 2002–03, RIL purchased a majority stake in Indian Petrochemicals Corporation Ltd. (IPCL), India's second largest petrochemicals company, from the government of India. IPCL was later merged with RIL in 2008. In 2005 and 2006, the company reorganized its business by demerging its investments in power generation and distribution, financial services and telecommunication services into four separate entities. In 2006, Reliance entered the organised retail market in India with the launch of its retail store format under the brand name of 'Reliance Fresh'. By the end of 2008, Reliance retail had close to 600 stores across 57 cities in India. In November 2009, Reliance Industries issued 1:1 bonus shares to its shareholders. In 2010, Reliance entered the broadband services market with acquisition of Infotel Broadband Services Limited, which was the only successful bidder for pan-India fourth-generation (4G) spectrum auction held by the government of India. In the same year, Reliance and BP announced a partnership in the oil and gas business. BP took a 30 per cent stake in 23 oil and gas production sharing contracts that Reliance operates in India, including the KG-D6 block for $7.2 billion. Reliance also formed a 50:50 joint venture with BP for sourcing and marketing of gas in India. The number of shares of RIL are approx. 3.1 billion. The promoter group, Ambani family, holds approx. 46.32% of the total shares whereas the remaining 53.68% shares are held by public shareholders, including FII and corporate bodies. Life Insurance Corporation of India is the largest non-promoter investor in the company, with 7.98% shareholding. In January 2012, the company announced a buyback programme to buy a maximum of 120 million shares for ₹104 billion (US$1.4 billion). By the end of January 2013, the company had bought back 46.2 million shares for ₹33.66 billion (US$470 million). The company's equity shares are listed on the National Stock Exchange of India Limited (NSE) and the BSE Limited. The Global Depository Receipts (GDRs) issued by the Company are listed on Luxembourg Stock Exchange. It has issued approx. 56 million GDRs wherein each GDR is equivalent to two equity shares of the company. Approximately 3.46% of its total shares are listed on Luxembourg Stock Exchange. Its debt securities are listed at the Wholesale Debt Market (WDM) Segment of the National Stock Exchange of India Limited (NSE). It has received domestic credit ratings of AAA from CRISIL (S&P subsidiary) and Fitch. Moody's and S&P have provided investment grade ratings for international debt of the company, as Baa2 positive outlook (local currency issuer rating) and BBB+ outlook respectively. On the 28th of December, 2017, RIL announced that it will be acquiring the wireless assets of Anil Ambani-led Reliance Communications for about ₹23,000 crores. The company's petrochemical, refining, oil and gas-related operations form the core of its business; other divisions of the company include cloth, retail business, telecommunications and special economic zone (SEZ) development. In 2012–13, it earned 76% of its revenue from refining, 19% from petrochemicals, 2% from oil & gas and 3% from other segments. In July 2012, RIL informed that it was going to invest US$1 billion over the next few years in its new aerospace division which will design, develop, manufacture, equipment and components, including aircraft, engine, radars, avionics and accessories for military and civilian aircraft, helicopters, unmanned airborne vehicles and aerostats. On 31 March 2013, the company had 123 subsidiary companies and 10 associate companies. Reliance Retail is the retail business wing of the Reliance Industries. In March 2013, it had 1466 stores in India. It is the largest retailer in India. Many brands like Reliance Fresh, Reliance Footprint, Reliance Time Out, Reliance Digital, Reliance Wellness, Reliance Trends, Reliance Autozone, Reliance Super, Reliance Mart, Reliance iStore, Reliance Home Kitchens, Reliance Market (Cash n Carry) and Reliance Jewel come under the Reliance Retail brand. Its annual revenue for the financial year 2012–13 was ₹108 billion (US$1.5 billion) with an EBITDA of ₹780 million (US$11 million). Reliance Life Sciences works around medical, plant and industrial biotechnology opportunities. It specializes in manufacturing, branding, and marketing Reliance Industries' products in bio-pharmaceuticals, pharmaceuticals, clinical research services, regenerative medicine, molecular medicine, novel therapeutics, biofuels, plant biotechnology, and industrial biotechnology sectors of the medical business industry. Reliance Institute of Life Sciences (RILS), established by Dhirubhai Ambani Foundation, is an institution offering higher education in various fields of life sciences and related technologies. Reliance Logistics is a single-window company selling transportation, distribution, warehousing, logistics, and supply chain-related products, supported by in-house telematics and telemetry solutions. Reliance Logistics is an asset based company with its own fleet and infrastructure. It provides logistics services to Reliance group companies and outsiders. Merged content from Reliance Logistics to here. See Talk:Reliance Industries/Archives/2013#Merge proposals. Reliance Clinical Research Services (RCRS), a contract research organisation (CRO) and wholly owned subsidiary of Reliance Life Sciences, specialises in the clinical research services industry. Its clients are primarily pharmaceutical, biotechnology and medical device companies. Reliance Solar, the solar energy subsidiary of Reliance, was established to produce and retail solar energy systems primarily to remote and rural areas. It offers a range of products based on solar energy: solar lanterns, home lighting systems, street lighting systems, water purification systems, refrigeration systems and solar air conditioners. Merged content from Reliance Solar to here. See Talk:Reliance Industries/Archives/2013#Merge proposals. Relicord is a cord blood banking service owned by Reliance Life Sciences. It was established in 2002. It has been inspected and accredited by AABB, and also has been accorded a licence by Food and Drug Administration (FDA), Government of India. Reliance Jio Infocomm Limited (RJIL) previously known as Infotel Broadband, is a broadband service provider which gained 4G licences for operating across India. Reliance Industrial Infrastructure Limited (RIIL) is an associate company of RIL. RIL holds 45.43% of total shares of RIIL. It was incorporated in September 1988 as Chembur Patalganga Pipelines Limited, with the main objective being to build and operate cross-country pipelines for transporting petroleum products. The company's name was subsequently changed to CPPL Limited in September 1992, and thereafter to its present name, Reliance Industrial Infrastructure Limited, in March 1994. RIIL is mainly engaged in the business of setting up and operating industrial infrastructure. The company is also engaged in related activities involving leasing and providing services connected with computer software and data processing. The company set up a 200-millimetre diameter twin pipeline system that connects the Bharat Petroleum refinery at Mahul, Maharashtra, to Reliance's petrochemical complex at Patalganga, Maharashtra. The pipeline carries petroleum products including naphtha and kerosene. It has commissioned facilities like the supervisory control and data acquisition system and the cathodic protection system, a jackwell at River Tapi, and a raw water pipeline system at Hazira. The infrastructure company constructed a 71,000 kilo-litre petrochemical product storage and distribution terminal at the Jawaharlal Nehru Port Trust (JNPT) Area in Maharashtra. LYF, a 4G-enabled VoLTE device brand from Reliance Retail. Network 18, a mass media company. It has interests in television, digital platforms, publication, mobile apps, and films. It also operates two joint ventures, namely Viacom 18 and History TV18 with Viacom and A+E Networks respectively. It also have acquired ETV Network and since renamed its channels under the Colors TV brand. Reliance Eros Productions LLP, joint venture with Eros International to produce film content in India. As on 31 March 2018, the company had 29,533 permanent employees of which 1,521 were women and 70 were employees with disabilities. It also had 158,196 temporary employees on the same date which makes a total of 187,729 employees. As per its Sustainability Report for 2011–12, the attrition rate was 7.5%. But currently, the same attrition rate has gone up to 23.4% in March 2015 as per latest report released by the organization. In its 39th Annual General Meeting, its chairman informed the shareholders of the investment plans of the company of about ₹1,500 billion (US$21 billion) in the next three years. This would be accompanied by increasing the staff strength in Retail division from existing strength of 35,000 to 120,000 in next 3 years and increasing employees in Telecom division from existing 3,000 to 10,000 in 12 months. International Refiner of the Year in 2013 at the HART Energy's 27th World Refining & Fuel Conference. This is the second time that RIL has received this Award for its Jamnagar Refinery, the first being in 2005. According to survey conducted by Brand Finance in 2013, Reliance is the second most valuable brand in India. The Brand Trust Report ranked Reliance Industries as the 7th most trusted brand in India in 2013 and 9th in 2014. RIL was certified as 'Responsible Care Company' by the American Chemistry Council in March, 2012. RIL was ranked at 25th position across the world, on the basis of sales, in the ICIS Top 100 Chemicals Companies list in 2012. RIL was awarded the National Golden Peacock Award 2011 for its contribution in the field of corporate sustainability. In 2009, Boston Consulting Group (BCG) named Reliance Industries as the world's fifth biggest 'sustainable value creator' in a list of 25 top companies globally in terms of investor returns over a decade. The company was selected as one of the world's 100 best managed companies for the year 2000 by IndustryWeek magazine. From 1994 to 1997, the company won National Energy Conservation Award in the petrochemical sector. The Ambani family holds around 45% of the shares in RIL. Since its inception, the company was managed by its founder and chairman Dhirubhai Ambani. After suffering a heart attack in 1986, he handed over the daily operations of the company to his sons Mukesh Ambani and Anil Ambani. After the death of Dhirubhai Ambani in 2002, the management of the company was taken up by both the brothers. In November 2004, Mukesh Ambani, in an interview, admitted to having differences with his brother Anil over 'ownership issues'. He also said that the differences "are in the private domain". The share prices of RIL were impacted by some margin when this news broke out. In 2005, after a bitter public feud between the brothers over the control of the Reliance empire, mother Kokilaben intervened to broker a deal splitting the RIL group business into the two parts. In October 2005, the split of Reliance Group was formalized. Mukesh Ambani got Reliance Industries and IPCL. Younger brother Anil Ambani received telecom, power, entertainment and financial services business of the group. The Anil Dhirubhai Ambani Group includes Reliance Communications, Reliance Infrastructure, Reliance Capital, Reliance Natural Resources and Reliance Power. 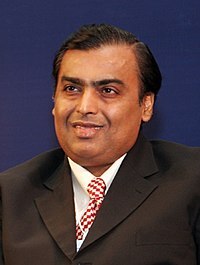 The division of Reliance group business between the two brothers also resulted in de-merger of 4 businesses from RIL. These businesses immediately became part of Anil Dhirubhai Ambani Group. The existing shareholders in RIL, both the promoter group and non-promoters, received shares in the de-merged companies. In May 2014, ONGC moved to Delhi High Court accusing RIL of pilferage of 18 billion cubic metres of gas from its gas-producing block in the Krishna Godavari basin. Subsequently, the two companies agreed to form an independent expert panel to probe any pilferage. Seminar magazine (2003) detailed Reliance founder Dhirubhai Ambani's proximity to politicians, his enmity with Bombay Dyeing's Nusli Wadia, the exposes by the Indian Express and Arun Shourie about illegal imports by the company and overseas share transactions by shell companies, and the botched attempt to acquire Larsen & Toubro. It switched shares sent for transfer by buyers to make illegal profits. It has indulged in insider trading in shares. It established a nexus with the Unit Trust of India to raise huge sums of money to the detriment of UTI subscribers. It attempted to monopolise the private telecom services market through front companies. Stock market fraud regulator Securities and Exchange Board of India (Sebi) issued a show-cause notice to Reliance Industries Ltd. following a probe into alleged insider trading in Reliance Petroleum Ltd (RPL) shares in November 2007. SEBI probed transactions by entities that participated in and led to some three months of speculative rally after which the RPL stock surged to an all-time intraday high of Rs295 on 1 November 2007. In a separate and independent investigation related to the same issue, the income-tax (I-T) department looked at possible tax evasion by a dozen entities that Mukesh Ambani-owned RIL acknowledged to be its “agents”. In Jan 2011, Sebi barred Anil Ambani and four other officials of Reliance Group—until recently known as the Reliance-Anil Dhirubhai Ambani Group (R-Adag)—companies from investing in listed shares until December 2011. Two group firms, Reliance Infrastructure Ltd (R-Infra) and Reliance Natural Resources Ltd (RNRL) were barred from making such investment until December 2012. According to Sebi’s investigations, R-Infra and RNRL were prima facie responsible for misrepresenting the nature of investments in yield management certificates/deposits, and the profits and losses in their annual reports for the fiscal years 2007, 2008 and 2009. It also found misuse of FII regulations. The then minister of state for finance Namo Narain Meena, on 1 December 2009, in a written response to a query raised in the Upper House of Parliament, said that three firms of R-Adag—R-Infra, RNRL and RCom—had violated overseas debt norms. These end-use violations were observed by the Reserve Bank of India (RBI) regarding two ECB transactions—of $360 million and $150 million—by R-Infra. In another case, Sebi settled a dispute with Reliance Securities Ltd (RSL) with a consent order on June 2011, under which the brokerage will spend Rs1 crore within six months on investor education and not add any new clients for 45 days starting 15 June. In the settlement, it was also added that the brokerage will also pay Rs25 lakh towards settlement charges. This order followed a Sebi investigation into RSL’s books and accounts for fiscal 2007 and fiscal 2008, which said that it had allegedly violated various clauses of Sebi stock brokers and sub-brokers regulations. The Sebi inquiry cited 20 irregularities, including the brokerage not informing clients about various charges at the time of opening accounts. RSL sought power of attorney in the name of Reliance Commodities Ltd from clients and used this to debit clients’ bank accounts, purchase and sell post office deposits and government of India bonds among other transactions. Brokerage, not fully equipped to handle its customer base at the time, used the name Reliance Money at all its offices and on employee visiting cards, instead of Reliance Securities, which was the registered trading member, leading to confusion. Brokerage was found to have received funds from other client bank accounts other than the ones available to it, thus failing to have a sound third-party check on the receipt of payments. RSL had failed to update client details despite the stock exchanges pointing this out in their inspection reports. The Sebi inquiry also said RSL collected higher securities transaction tax from its clients in 2006-2008, allotted more than one terminal in the same segment for a single user, and also collected cheques in the name of Reliance Money. Brokerage also did not maintain clear segregation between broking and other activities of group companies. Further, there were frequent disruptions in the brokerage’s trading platform, which showed connectivity problems at the applicant’s end. In the 2G spectrum case, Reliance Telecom was charged with criminal conspiracy to cause criminal breach of trust by a public servant, criminal conspiracy under section 120-B, cheating under section 420 and forgery under sections 468 and 471. Reliance Telecom was booked under the Prevention of Corruption Act, 1988. Additionally, individual charges were filed against three of Reliance Group's corporate executives: Gautam Doshi, Surendra Pipara and Hari Nayar, which resulted in their arrests. The Central Bureau of Investigation (CBI) filed a chargesheet in a Mumbai court against Reliance Industries Limited (RIL) and four retired employees of National Insurance Company Limited (NICL), including a former CMD, under provisions of the Prevention of Corruption Act for criminal conspiracy and other charges. Acting on a reference from CVC in March, 2005, the CBI started probing the conspiracy that led to the filing of the chargesheet on December 9, 2011. The 2005 complaint had alleged irregularities in issuance of insurance policies — for coverage of default payments — by NICL to RIL. Chargesheet also mentioned criminal offences with dishonest intention and causing wrongful loss totaling Rs 147.41 crore to NICL and wrongful gain to the private telecom provider. Two retired senior officials of National Insurance Company Limited and 11 others were awarded varying jail terms by a Delhi court in Jan 2014. A business jet owned by Reliance Industries (RIL) was grounded by The Directorate General of Civil Aviation (DGCA) on 22 March 2014 during a surprise inspection, for carrying expired safety equipment on board; its pilot was also suspended for flying without a licence. In May 2014, ONGC moved to Delhi High Court accusing RIL of pilferage of 18 billion cubic metres from its gas-producing block in the Krishna Godavari basin. Subsequently, the two companies agreed to form an independent expert panel to probe any pilferage. The Reliance Industries Limited (RIL) was supposed to relinquish 25% of the total area outside the discoveries in 2004 and 2005, as per the Production Sharing Contract (PSC). However, the entire block was declared as a discovery area and RIL was allowed to retain it. In 2011, the Comptroller and Auditor General of India (CAG) criticized the Oil Ministry for this decision. The CAG also faulted RIL for limiting the competition in contracts, stating that RIL awarded a $1.1 billion contract to Aker on a single-bid basis. A PIL filed in the Supreme Court by an NGO Centre for Public Interest Litigation, through Prashant Bhushan, challenged the grant of pan-India licence to RJIL by the Government of India. The PIL alleged that RJIL was allowed to provide voice telephony along with its 4G data service, by paying an additional fees of just INR16580 million (US$280 million) arbitrary and unreasonable, and contributed to a loss of INR228420 million (US$3.8 billion) to the exchequer. The CAG in its draft report alleged rigging of the auction mechanism, whereby an unknown ISP, Infotel Broadband Services Pvt Ltd, acquired the spectrum by bidding 5000 times its net worth, after which the company was sold to Reliance Industries. ^ a b c d e "RIL Annual Report 2019". RIL. ^ "Reliance Industries Ltd. Share holding pattern". NDTV Profit. Retrieved 8 November 2016. ^ "RIL Financial Performance". Retrieved 13 June 2018. ^ "Top companies in India by Net Profit". Moneycontrol.com. Retrieved 20 July 2017. ^ "Top '100' companies by market capitalisation as on July 19, 2017". Bseindia.com. Retrieved 20 July 2017. ^ "Global 500". CNN.com. Retrieved 14 August 2013. ^ a b "Reliance Industries AGM full text". Retrieved 21 July 2017. ^ "Ambani: From a gas station attendant to Reliance owner". Arab News. 2 November 2012. Retrieved 26 August 2013. ^ a b c d e f "Company History – Reliance Industries Ltd". Economic Times. Retrieved 26 August 2013. ^ a b c d "Major Milestones". RIL.com. Archived from the original on 17 August 2013. Retrieved 22 August 2013. ^ "Reliance Industries: Milestones of an oil giant – Slide 4". NDTV.com. Retrieved 25 August 2013. ^ "Company History – Reliance Industries". MoneyControl.com. Retrieved 26 August 2013. ^ a b c d "Reliance Industries Ltd". HDFC Securities. Retrieved 26 August 2013. ^ "Reliance Industries: Milestones of an oil giant – Slide 8". NDTV.com. Retrieved 25 August 2013. ^ "Reliance Industries: Milestones of an oil giant – Slide 9". NDTV.com. Retrieved 25 August 2013. ^ "Krishna-Godavari basin to yield 160mt oil: RIL". Economic Times. 1 November 2002. Retrieved 25 August 2013. ^ "Reliance makes it big with IPCL". The Hindu. 20 May 2002. Retrieved 25 August 2013. ^ "IPCL set to merge with Reliance Industries". Business Standard. 8 March 2007. Retrieved 25 August 2013. ^ "Reliance-IPCL merger swap ratio set at 1:5". Financial Express. 11 March 2007. Retrieved 25 August 2013. ^ a b "Scheme of Demerger". RIL.com. Archived from the original on 9 May 2013. Retrieved 25 August 2013. ^ "BTvIn - Retail: Growth Engine For RIL". Btvin. ^ "Reliance launches retail venture". BBC News. 3 November 2006. Retrieved 25 August 2013. ^ "Coming to your neighbourhood – Reliance Fresh". Business Standard. 3 November 2006. Retrieved 25 August 2013. ^ "Reliance Bets Big on 4G". WSJ. 12 June 2010. Retrieved 25 August 2013. ^ "Reliance Industries to acquire Infotel Broadband". The Hindu. 11 June 2010. Retrieved 25 August 2013. ^ "BP partners Reliance in $7.2 billion Indian oil hunt". Reuters India. 22 February 2011. Retrieved 25 August 2013. ^ "Reliance Industries, BP complete $7.2-billion deal". Economic Times. 31 August 2011. Retrieved 25 August 2013. ^ "RIL, Russia's Sibur join hands for Jamnagar butyl rubber unit". Economictimes.com. Retrieved 19 July 2017. ^ a b c "Reliance Industries >> Shareholding Pattern - March 2017". www.moneycontrol.com. Retrieved 20 July 2017. ^ a b c d e f "Annual Report 2012-13" (PDF). RIL.com. 8 May 2013. Archived from the original (PDF) on 16 October 2013. ^ "Reliance Industries buyback: Beyond face value". The Indian Express. 18 January 2013. Retrieved 24 August 2013. ^ "Investors' Handbook". Ril.com. Archived from the original on 17 August 2013. Retrieved 15 August 2013. ^ "Reliance Industries Ltd. – Listing". Economic Times. Retrieved 25 August 2013. ^ "Listing Information". RIL.com. Archived from the original on 26 May 2013. Retrieved 26 August 2013. ^ "Credit Ratings". RIL.com. Archived from the original on 21 July 2013. Retrieved 26 August 2013. ^ "S&P raises credit rating on RIL to 'BBB+'". Reuters India. 29 May 2013. Retrieved 26 August 2013. ^ "Rating Action: Moody's assigns definitive Baa2 rating to Reliance's USD senior unsecured perpetual notes". Moody's. 31 January 2013. Retrieved 26 August 2013. ^ "'White knight' Mukesh's RJio to buy RCom's wireless assets". Thehindubusinessline.com. Retrieved 26 August 2018. ^ "RIL lines up close to $1 billion plan in aerospace sector, may hire around 1,500 people". The Times of India. 28 July 2012. Retrieved 26 August 2013. ^ "Financial Presentation of 2012–13 Q4 Results". RIL.com. 16 April 2013. Archived from the original on 3 April 2015. Retrieved 27 August 2013. ^ "Ambani tops retailer list, too". Business Standard. 17 August 2013. Retrieved 19 August 2013. ^ "Few RIL retail arms still making losses". Business Standard. 11 May 2013. Retrieved 27 August 2013. ^ "About us, Reliance Life Sciences". RelLife.com. Retrieved 18 August 2013. ^ "Changing its DNA". Business Today. 30 September 2012. Retrieved 26 August 2013. ^ "Welcome to Reliance Institute of Life Sciences". RILS.com. Archived from the original on 8 August 2013. Retrieved 18 August 2013. ^ "Reliance Institute of Life Sciences". Minglebox.com. Retrieved 26 August 2013. ^ "Company Overview of Reliance Logistics Private Limited". BusinessWeek. Retrieved 27 August 2013. ^ "About us, Reliance Logistics". Reliancelogistics.com. Archived from the original on 21 November 2010. Retrieved 18 August 2013. ^ "Reliance in deal with CONCOR for logistics venture". 25 September 2007. Archived from the original on 27 August 2013. Retrieved 27 August 2013. ^ "Reliance Logistics Ltd". Supplychainleaders.com. Retrieved 27 August 2013. ^ "Reliance set to combine two logistics arms". Financial Chronicle. 31 March 2009. Retrieved 27 August 2013. ^ "Clinical Research Services (CRS) group of Reliance Life Sciences". RelLife.com. Retrieved 18 August 2013. ^ "About us, Reliance Solar". Relsolar.com. Archived from the original on 11 September 2013. Retrieved 18 August 2013. ^ "About us, Relicord". Relicord.com. Archived from the original on 12 August 2013. Retrieved 18 August 2013. ^ "AABB Accredited Cord Blood (CB) Facilities". AABB.org. Retrieved 18 August 2013. ^ "Reliance Industries buys 95% stake in Infotel Broadband for Rs 4,800 cr". The Times of India. 12 June 2010. Retrieved 18 August 2013. ^ "RIL Subsidiaries & Associates". RIL.com. Archived from the original on 12 August 2013. Retrieved 20 August 2013. ^ "Company History". Moneycontrol.com. Retrieved 22 August 2013. ^ "About us". RIIL.in. Retrieved 18 August 2013. ^ "LYF Smartphones - Its All About Your Lifestyle". MyLYF. Retrieved 1 March 2016. ^ "Sustainability Report 2011-12" (PDF). RIL.com. Archived from the original (PDF) on 8 October 2013. Retrieved 25 August 2013. ^ "(RIL) to invest Rs 1.5 lakh crore over three years; increase staff strength". Indian Express. 7 June 2013. Retrieved 27 August 2013. ^ "Reliance Industries AGM full text". Retrieved 21 July 2017. ^ "RIL bags Refiner of the Year Award". Economic Times. 22 March 2013. Retrieved 20 August 2013. ^ "India's top 50 brands". Brandirectory.com. Retrieved 19 August 2013. ^ "Tata, Reliance, Mahindra & Mahindra, 3 Mumbai brands among Indias 10 Most Trusted, but Delhi flexes muscles too". Financialexpress.com. Retrieved 26 August 2018. ^ "Reliance Industries Ltd gets certified as a 'Responsible Care' under American Chemistry Council". Economic Times. 4 March 2012. Retrieved 22 August 2013. ^ "Top 100 Chemical Companies 2012". ICIS.com. 10 September 2012. Retrieved 22 August 2013. ^ "Award for Sustainability(GPAS)". Goldenpeacockawards.com. Retrieved 25 August 2013. ^ "RIL named among 25 sustainable value creators globally: BCG". Economic Times. 14 October 2009. Retrieved 25 August 2013. ^ "RIL among world's 100 best-managed cos". Rediff.com. 29 August 2000. Retrieved 25 August 2013. ^ "Mukesh Ambani admits to differences with Anil". Rediff.com. 18 November 2004. Retrieved 28 August 2013. ^ "Ambani vs Ambani". India Today. 6 December 2004. Retrieved 28 August 2013. ^ "Cover Story: Ambani Settlement". India Today. 4 July 2005. Retrieved 28 August 2013. ^ "Reliance Industries: Milestones of an oil giant". NDTV.com. Retrieved 28 August 2013. ^ "Corporate Announcement – Reliance Industries hands over control of Four Demerged Companies to ADAG". Bseindia.com/. 8 February 2006. Retrieved 28 August 2013. ^ "Reliance demerger: What should you do?". Rediff.com. 17 January 2006. Retrieved 27 August 2013. ^ "RIL pens demerger buyout cost". Business Standard. 17 January 2006. Retrieved 28 August 2013. ^ "Independent panel to probe discrepancies in Krishna-Godavari Basin". Hindustantimes.com. Retrieved 30 May 2014. ^ "Independent panel to probe discrepancies in Krishna-Godavari Basin". News.biharprabha.com. Retrieved 30 May 2014. ^ "Blind Ambition". Outlookindia.com/. Retrieved 26 August 2018. ^ "Sebi notice to RIL on RPL insider trading - Livemint". www.livemint.com. Retrieved 26 August 2018. ^ "Sebi bars Anil Ambani from stock investing - Livemint". www.livemint.com. Retrieved 26 August 2018. ^ "RSL settles with Sebi; pays Rs25 lakh, won’t add clients for 45 days - Livemint". www.livemint.com. Retrieved 26 August 2018. ^ "2G scam: Charges against Raja, others". Ndtv.com. Retrieved 26 August 2018. ^ "2G case: SC grants bail to 5 corporate executives". The Economic Times. 2 December 2011. Retrieved 26 August 2018. ^ "NICL scam: CBI files charges against Reliance Industries Limited, 4 retired insurance firm employees". The Times of India. Retrieved 26 August 2018. ^ India, Press Trust of (24 January 2014). "NICL scam: 13 sentenced to jail". Business Standard. Retrieved 26 August 2018. ^ "ONGC moves Delhi High Court, alleges gas pilferage by Reliance". Hindustantimes.com. 15 May 2014. Retrieved 26 August 2018. ^ "Independent panel to probe discrepancies in Krishna-Godavari Basin". News.biharprabha.com. Retrieved 26 August 2018. ^ "CAG flays Oil Min for allowing RIL to retain D6 area". India Today. Retrieved 26 August 2018. ^ "Reliance violated contract terms in KG Basin, finds CAG report". Financialexpress.com. Retrieved 26 August 2018. ^ "Petition against 4G licence to Reliance Jio: Apex court seeks Centre's reply". Thehindubusinessline.com. Retrieved 26 August 2018. ^ "Reliance Jio goes for the kill". Rediff.com. Retrieved 26 August 2018.